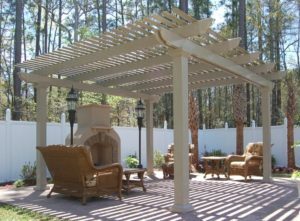 A pergola is the perfect addition if you’d like to make your property in Savannah, Georgia, more attractive and get more use of your outdoor space. One of these elegant structures can help to define a space on your property, such as a patio or picnic area, and provide partial shade while still letting plenty of natural light pass through for you to enjoy. At Porch Outfitters, we have been the area’s leading pergola installer since 1987, making us one of the most experienced companies available to handle the job. When you turn to us, you can rest assured that your project is in the most capable hands, as we’ve earned numerous accolades over the years, including an A+ rating with the Better Business Bureau. To learn more about the benefits of choosing Porch Outfitters to install a pergola at your home in Savannah, GA, contact us today.